Is a creative project aimed at showcasing the new wave of virtual reality works. Pushing the boundries of the medium and assisting experienced content creators to create VR works. 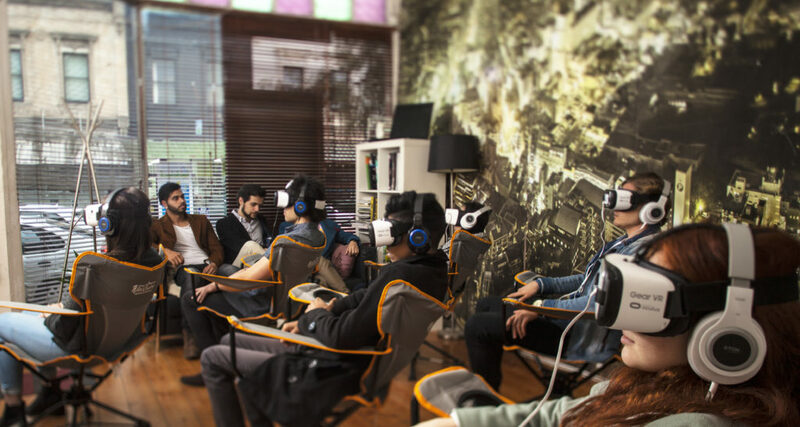 By having a VR cinema space to screen, network and showcase film makers works. 12 seat Gear VR Cinema with comfortable spinning chairs, put a light-weight gear VR headset and start your journey to Virtual reality. The Virtual Reality Cinema has a unique approach and platform the we use and have developed. It allow for seamless viewing of VR Content across all the gear VR headsets. Playing back synchronized 360VR & Spatial Audio and our custom proprietary Group VR system. Which enables all the participants to experience VR together and see each other which borrows more from theatrical ideas.We screen 4-6 shorts one after the other in a seamless playback over 20-30 minute seamless show.